INDIANAPOLIS (AP) — LaMarcus Aldridge hopes San Antonio’s victory over Indiana is enough to get the Spurs back on track. 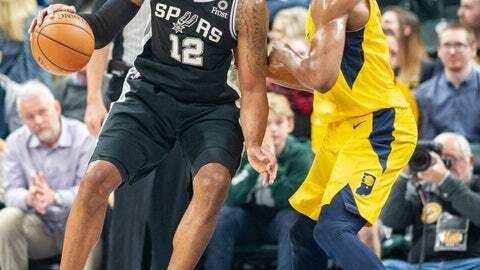 Aldridge had 33 points and 14 rebounds to lead the Spurs to a 111-100 victory over the Pacers on Friday night after San Antonio endured a stretch of five losses in six games. DeMar DeRozan had 16 points and six assists and Patty Mills added 15 points off the bench for the Spurs, who avoided a second straight sweep in the series. Bojan Bogdanovic had 21 points, Domantas Sabonis had 19 points and 16 rebounds, and reserve Cory Joseph added 18 points and seven assists for the short-handed Pacers, playing without All-Star guard Victor Oladipo for a third straight game with a sore right knee. Center Myles Turner also was out with a sore left ankle. The Spurs got off to a quick start and never trailed, scoring eight of the first nine points in the game. San Antonio took a 54-45 halftime lead and then went on a 9-2 run to open the second half. The Spurs took a 63-47 lead on Bryn Forbes‘ 3-pointer with 8:56 remaining in the third quarter. San Antonio led by as many as 20 points when Mills scored on a layup to make it 72-52 with 5:44 left in the third. The Pacers went on a 7-1 run to close out the third quarter. Joseph scored to make it 82-69 with 4 seconds left in the period. San Antonio won its first game against an Eastern Conference opponent to move to 1-3 against teams in the East. The Pacers shot 63 percent (34 of 54) in the paint with a season-high 68 points in the paint. Aside from Oladipo and Turner, Sabonis was a game-time decision with a sprained right ankle. He was cleared to play after going through pregame wrap-ups. Turner was also a game-time decision. He and Oladipo went through pregame shoot-around, but sat the bench in street clothes. Spurs: San Antonio shot 50.6 percent from the field. … F Rudy Gay had 11 points, 12 rebounds and seven assists. … Forbes scored eight of his third points in the third quarter. … C Pau Gasol missed his ninth straight game with left foot soreness. Pacers: Indiana shot 46.5 percent from the field. … F Thaddeus Young had 12 points and five rebounds. … Indiana scored 18 points off San Antonio’s 15 turnovers. Spurs: At Milwaukee on Saturday for second of a four-game road trip. Pacers: At Utah on Monday for the first of four straight road games.